Mansfield, 64 @ Attleboro, 51 – Final – Mansfield opened the second half with a 12-2 surge, turning a deficit into an eight-point lead and never looked back. Attleboro held a 30-28 lead at the break but Mansfield took control of the game by outscoring the Bombardiers 22-8 in the frame. 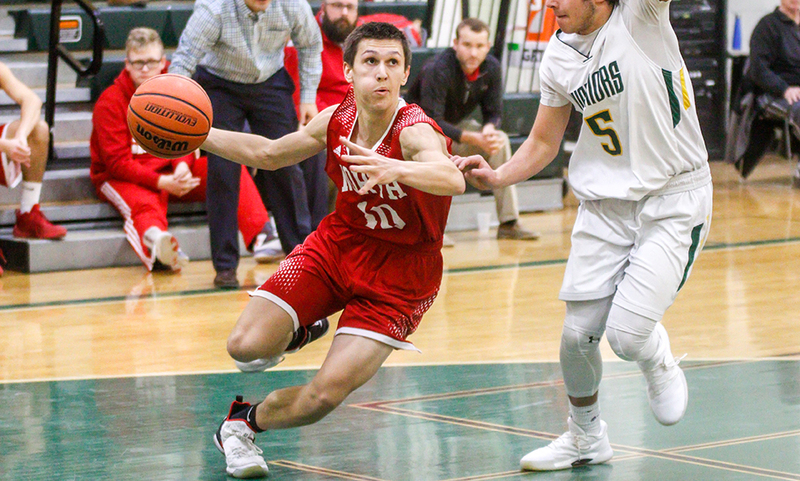 Mansfield senior John McCoy dropped a career-high 24 points, hauled in nine rebounds, had five assists and four steals to lead the Hornets, who totaled 10 steals as a team. Damani Scott tied a career-high with 13 points and grabbed seven rebounds while Ryan Otto chipped in with 10 points. Attleboro sophomore Bryant Ciccio tied a career-high with 17 points. Milford, 51 @ Canton, 61 – Final – Canton connected on 14 three-pointers as a team, jumping out to a 19-5 lead at the end of the first quarter, and a 30-17 lead at the break. The Bulldogs furthered the lead with a 21-12 third quarter. Senior Tony Harris led the way with 18 points while classmate Austin Maffie netted 17 points for the Bulldogs. Milford junior Brendan White led the Hawks with 14 points. Stoughton, 41 @ Foxboro, 54 – Final – Foxboro increased its lead after each of the first three quarters to beat the visiting Black Knights. The Warriors led 16-11 after one, 31-20 at the halftime break, and 43-29 heading into the final quarter. Sophomore Brandon Borde led the way offensively with a game-high 19 points while senior Bobby Harrison added 14 points and senior Joe Morrison chipped in with 13 points. Stoughton head coach John Gallivan noted that Alex Sjoquist played well defensively for the Black Knights. Taunton, 60 @ Franklin, 72 – Final – Click here for a recap of this game. 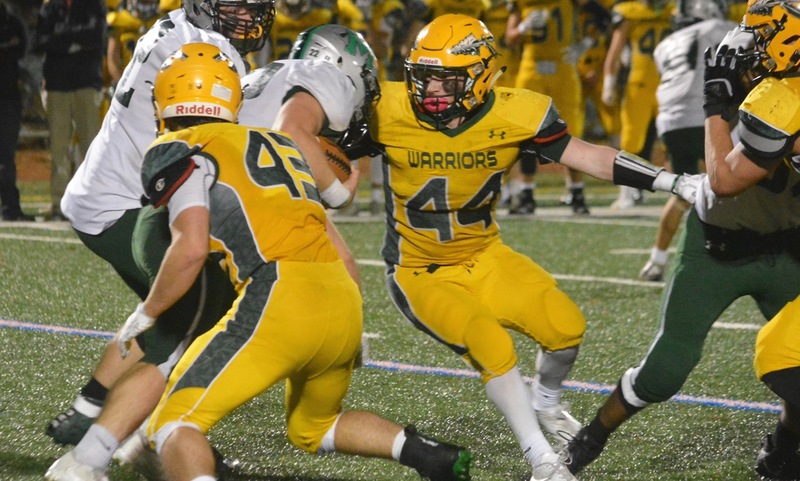 King Philip, 53 @ Oliver Ames, 51 – Final – King Philip outscored Oliver Ames 21-14 in the third quarter to take a lead and held off a late comeback attempt from OA to earn the win. The Warriors had eight players get on the score sheet, led by Brendan King’s 11 points. Both Pharoah Davis and Tom Madden added nine points while Tim Nault chipped in with seven points. Jack Spillane led Oliver Ames with 23 points, including 13 in the fourth quarter, while junior Ethan Eckstrom scored 11 points. North Attleboro, 67 @ Sharon, 61 – Final – North Attleboro overcame an early 16-2 deficit with a strong second half to earn the win. Sharon led 16-7 after the first quarter and 27-20 at the halftime break. Big Red came out with a huge third quarter, outscoring the Eagles 18-7 to seize a lead, and then built a 62-47 lead with just under two minutes to play. North senior Chad Peterson came off the bench, hitting three triples in the second half on his way to a game-high 15 points. Josh Montague added 13 points, Ethan Friberg scored a career-high 11 points (10 in the second half) and junior Jake Petersen had eight points. Sharon senior Malik Lorquet had a game-high 17 points and 12 rebounds while Alex Kaufmann added 16 points and Jimmy Fitzhenry had 11 points and three steals. Attleboro, 31 @ Mansfield, 52 – Final – Mansfield opened a one-game lead on Attleboro in the league standings with the win. Meg Hill scored 15 points, had 11 boards, and blocked three shots for the Hornets, who also got 11 points from Erin Daniel, eight points and six assists from Mady Bendanillo, and eight points and nine rebounds from Maggie Danehy. Attleboro got 10 points from Sam Pierce and eight points from Liv McCall in the loss. Canton, 38 @ Milford, 49 – Final – Click here for a Recap and Photo Gallery from this game. Foxboro, 74 @ Stoughton, 46 – Final – Ashley Sampson scored 23 points to lead the Warriors to a seventh straight win, six of which were by double digits. Lily Sykes added 15, Shannon Smally had 13, and Grace Tamulionis had 10 points for Foxboro. Stoughton sophomore Shyanne Trinh led the Black Knights with 10 points. Franklin, 55 @ Taunton, 41 – Final – Sophomore center Ali Brigham recorded a triple-double to help the Panthers earn the road win and stay within a game of first place Mansfield. Brigham scored 15 points, recorded 13 rebounds, and had 10 blocks on the night. Oliver Ames, 47 @ King Philip, 34 – Final – Leading 32-28 with four minutes to play, Oliver Ames closed the game with a 15-6 run to put the game away and earn the win. Senior Kayla Raymond had a monster night with 30 points, 13 rebounds and four blocks to lead the way for the Tigers, who trailed KP 16-14 at the half. Alex Sheldon added 10 points and eight rebounds in the win for OA. Sharon, 51 @ North Attleboro, 49 – Final – Telishya Herbert led the way with 17 points for the Eagles, who earned their first league win of the season. Emma Eberhardt added 13 points in the win. Franklin, 130.85 @ Oliver Ames, 136.6 – Final – Franklin junior Mia Lizotte won the all-around for the third straight meet with a 35.95, edging out Oliver Ames’ Hannah Moynihan (35.5). Lizotte earned an 8.85 on beam, an 8.7 on bars and a 9.2 on both vault and floor. Franklin senior Liz Traphagen was second for the Panthers on the vault (8.2) and the floor (9.0). Junior Sadie Rondeau was second for the Panthers on both the bars and the beam. CANTON, Mass. – Canton head coach Ryan Gordy was clear on what helped his Bulldogs beat visiting King Philip on Tuesday night. “Devin Foster,” Gordy said without hesitation. And the answer wasn’t much of a surprise as Foster poured in 27 points, hauled in six rebounds and dished out six assists to help Canton survive with a 66-57 win over the Warriors. 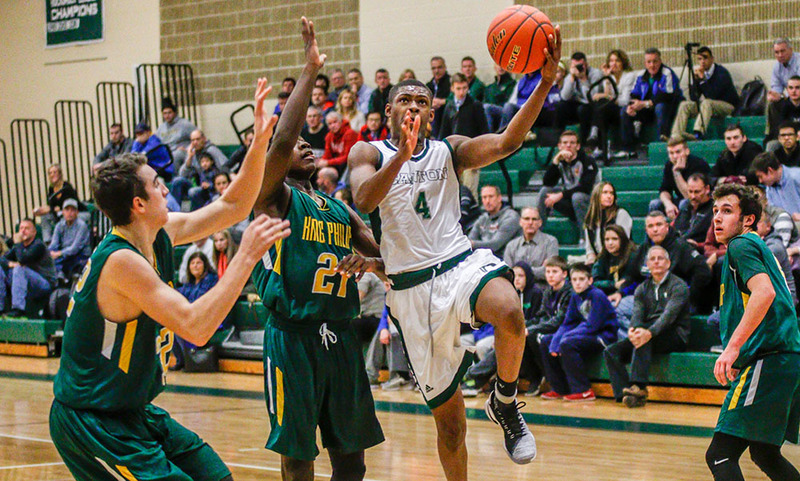 Canton led by as much as 19 in the second half, but struggles from the free throw line (9-for-22) kept the door open for a comeback, and King Philip nearly orchestrated just that in the fourth quarter. Foster had 15 of his points in the first half, forcing KP head coach Mark Champagne to switch up his defense and put junior Kyle Layman on Foster defensively. Layman kept Foster scoreless over the first five minutes of the third. But off of an inbounds play, Foster found space against KP’s zone and drained a corner three. That basket sparked an 11-3 run over the final two minutes of the third. Kyle Fitzgerald finished a layup to make it 47-31 Canton. King Philip answered when sophomore Robert Jarest drained a three but Foster came back and hit a big three of his own after a nice screen from Tony Harris (14 points, seven rebounds). After getting a stop, Foster drove to the basket to draw the defense in and kicked it to Austin Maffie for a triple and a 53-34 lead late in the third. It looked as though a three from Harris would be enough when he made it 60-46. But King Philip had other plans. Behind the strong play of sophomore Andrew McKinney (13 points) and Layman (13 of his 18 points in the second half), KP rattled off an 11-1 run. McKinney hit back-to-back layups, Layman hit two free throws and McKinney drove to the basket for two more to cut the deficit to six. Canton’s Matt Warburton converted down low off a nice feed from Foster with two minutes left to get it back to eight, but another Layman free throw followed by a McKinney mid-range jumper made it 62-57 with just over a minute left. KP even forced another stop but turned it over without getting a shot off. Foster went 4-for-4 from the line in the final 30 seconds to ice the game. “I thought our shot selection was better and we made some stops on defense,” Champagne said of getting back into the game. To their credit, Foster really was on balance. Ryan [Gordy] does a really good job coaching them to their strengths. Similar to Foxboro with [Joe] Morrison and [Brandon] Borde, Canton knows who their scorers are. And we weren’t disciplined on defense at times and [Maffie] got a couple of shots, and we knew he could shoot it. King Philip led 16-15 after the first quarter with five different players scoring but Canton outscored the Warriors 20-9 in the second quarter, taking a 10-point lead (35-25) into the halftime break. 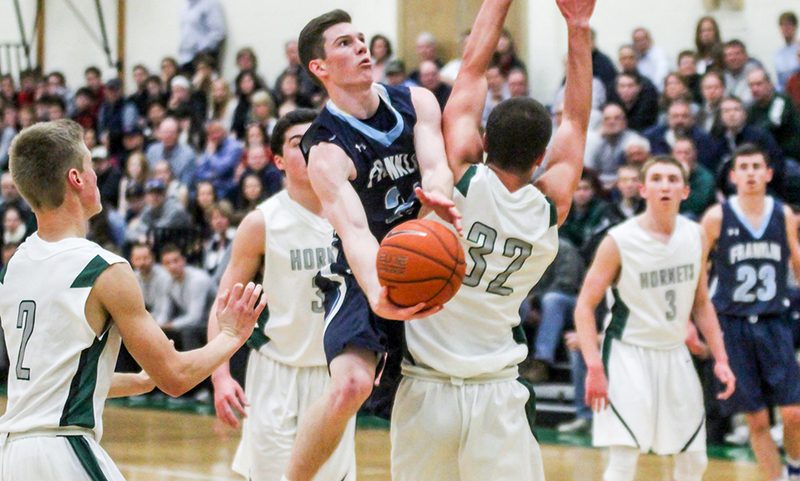 Senior Jake Verille scored nine of his 11 points in the first half while Maffie hit a three in each half. Tom Madden added six points and a game-high 14 rebounds for KP while Pharoah Davis added seven points. Champagne is encouraged with the progress his team is making after five players — all who play valuable minutes — got off to a delayed start because of the football season. Canton boys basketball (2-1 Hockomock, 2-1 overall) will resume Hockomock League play in the new year, but will host Boston Latin on December 28th to close the calendar year. King Philip (1-2, 1-2) heads to the Bridgewater-Raynham tournament to take on Dorchester on December 27th.